I’ve been in the team for 6 years now and I’ve been part in as many mod releases. For me the procedure is not new and even though, when I manage the task-lists, it looks like so much work and I often wonder how all of this actually gets done in the short time between closing time and falling into the bed exhaustedly. I usually have the honorsof introducing new people to the team, I like to know who I’m working with, so I like this a lot. I explain our way of work, our infrastructure, who pretends to be the boss and how we work on the cars. Actually, the latter is something more hard to explain, because if you haven’t actually done a completely release-cycle, you only get to hear strange terms and abbreviations and you barely get them in order. 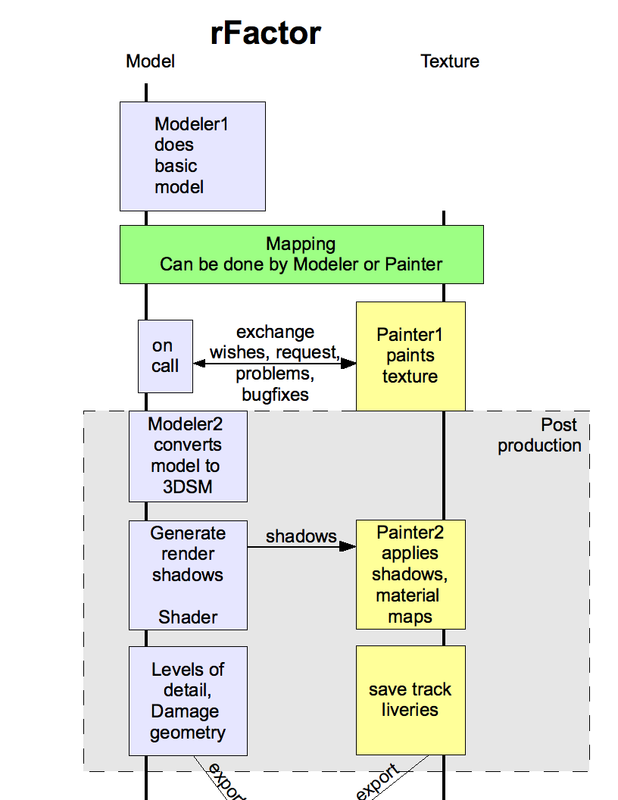 To get the picture, I made a sequence diagram (software engineering stuck :D). 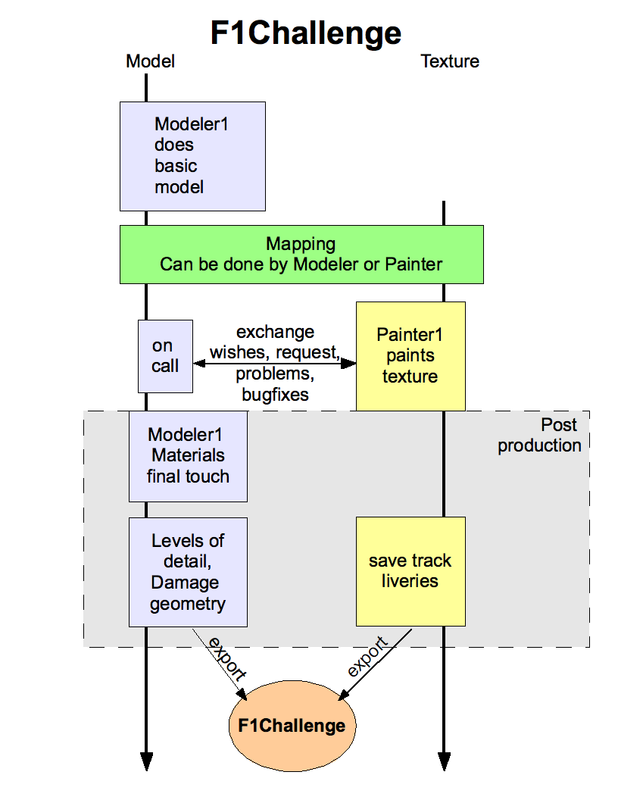 This shows the development steps for the model and for the related texture. 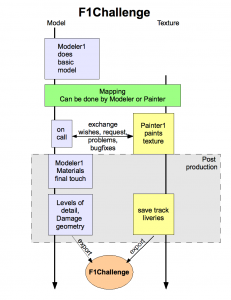 A modeller starts out with the basic model. Once this is done, somebody maps the car, this can be the modeler or the painter if he prefers it. The painter paints this texture and the modeler is on call for maybe necessary changes. When the texture is done, we have basic car ready, but there is still a lot to do. 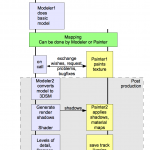 A second modeller takes the raw-model and converts it to 3DSM. Here the normals are fixed, the materials and shaders are cleaned up and applied. Andy bakes the shadows and the shadows are applied to the texture by the same or by a different painter. The textures get the final touchups and are ready to be exported in all track variations. The modeller continues with the Lods (Levels of details (low-polygon cars in the distance to save performance)) and does the damage geometry, which is the physical damage calculation in rFactor. The model and the defined values ingame have to compliment each other. Now the model, the texture and everything else directly related is done and ready for export to rFactor. Not counting additional stuff like tyres, helmets, steering wheels, driverbody, which are added at the end. You see the procedure has quite some complexity and of course, since we don’t work on tight schedule there are bottlenecks, where somebody is waiting for somebody else to be done. This is natural. We try to streamline it where possible, but at the end I can only say, we are no robots and we don’t try to be. For comparison I build a similar graph for F1Challenge, which was a bit simpler. The post-production didn’t take as long. rFactor’s export requires some magic, that only few can do. Andy and Afborro are our export-experts, who can get the modells ingame and they look stunning. So at the end of the day all cars go through their hands. Same with the textures, where all textures were either saved by Whata or by me. This resulted in the unified look that the CTDP-mods exhibit. Another look into the CTDP Candy Factory. When you make your skins, what program do you use? I have made some of the skins i have for some mods more realistic, but as i have Photoshop CS3(Yes? ), the skins in-game are stupidly shiney (as if they have a layer of plastic over them to make them super-smooth). Could you help? I suggest you read our tutorials for putting cars ingame. Your texture needs an alpha channel to define the strength of reflection. You have to save the textures in DXT5 format, in DXT1, the alpha will be only black/white. For my GP4 car-making, the LOD was done before being mapped….